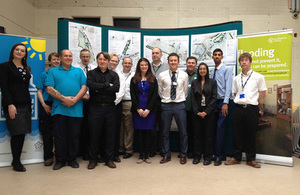 Plans for the first phase of the new Leicester flood risk management scheme were yesterday (10 April 2014) unveiled at a public drop-in event. The 1pm to 8pm event at Abbey Pumping Station Museum on Corporation Road, Leicester, was jointly organised by the Environment Agency and Leicester City Council. The key objective of the Leicester flood risk management scheme is to reduce flood risk from river and surface water flooding and is a joint initiative between the Environment Agency and Leicester City Council. Construction of the first phase is expected next year. A significant area of Leicester is at risk of flooding from the River Soar or nearby smaller watercourses. In November 2012, large parts of the city narrowly avoided flooding, but we need to plan for the future. The project will also help to release the economic potential of brown field sites currently at significant risk of flooding, whilst improving the public open spaces alongside the river. As part of the project, the Environment Agency carried out a four week programme of exploratory ground investigations in January. This exercise allowed the project team to understand the makeup of the ground along the River Soar. The ground investigations were just part of a series of surveys and investigations which were undertaken to help shape the project. It has been a really exciting and marvellous opportunity so far to work on this new plan for Leicester. Together with partners Leicester City Council, we’re continuing to develop a holistic approach to reducing flood risk for the local community, which ultimately will help deliver wider economic and environmental benefits. We are pleased to be a partner in this project and that we have been able to recommend this site for flood risk management work around wetland and conservation. It’s great that the Environment Agency has chosen to put its energy and resources into reducing the risk of flooding to homes and businesses in the city, as well as improving the riverside environment. We will continue to work closely with our Environment Agency colleagues to deliver these improvements.